£4 per session, for children up to 4 years old. 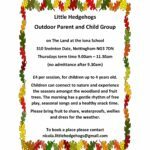 Children can connect to nature and experience the seasons amongst the woodland and fruit trees. The morning has a gentle rhythm of free play, seasonal songs and a healthy snack time. Please bring fruit to share, waterproofs, wellies and dress for the weather.